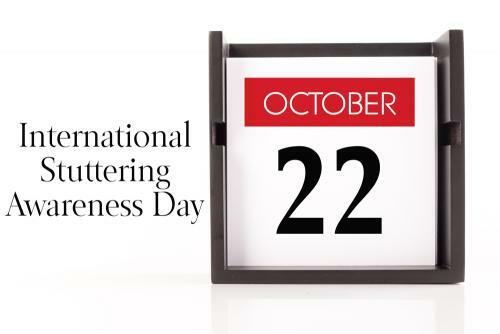 Since 1998, October 22nd has been known as International Stuttering Awareness Day (ISAD). I didn’t know ISAD existed until late 2016, early 2017 and I celebrated my first ISAD last year. Celebrate. It’s a unique word choice, isn’t it? For most of my life, celebrate was the last word I would associate with stuttering and definitely the last thing I wanted to do in terms of my stutter. When I thought of stuttering, words such as: different, hide, avoid, self-doubt, self-conscious, blocking, frustration, and why, came to mind. When I listed the things I wanted to do in terms of stuttering they included: avoid the topic altogether and not talk about it. When I went back to speech therapy five years ago, my list of things I wanted to do changed. Avoidance was replaced with: talking on the phone without a script, becoming a more confident public speaker, and ordering through a drive-thru, amongst others. Words such as: hide, self-doubt, and different were replaced with acceptance, good, and me. Yet, celebrate was still not on that list. I could not, nor would not celebrate the small victories that I had with stuttering each day. Up until two and a half years ago, celebrate continued to not be on my word association list. That changed in May of 2016 when the word “celebrate” slowly crept into my stuttering vocabulary. I celebrated my first National Stuttering Awareness Week (NSAW) and posted a stuttering related article to my social media accounts during NSAW 2016 with the caption, “Happy National Stuttering Awareness Week!” As a result of NSAW 2016, I started to allow myself to celebrate the small victories of stuttering. Celebrate took on a bigger meaning in my stuttering vocabulary in spring 2017 when I began blogging about my journey with stuttering. For the first time, I was not hiding my stutter from the world. Rather, I was celebrating one of my differences and letting other people who stutter (PWS) know that they are not alone. From personal experience, meeting other PWS is cause enough for a celebration. Celebrate has taken on a bigger meaning for me in the past year and half. I now lead a stuttering support group. I talk about my stutter openly. I write about my experiences with stuttering on a regular basis and on numerous platforms. I have talked to numerous groups about stuttering and my journey with stuttering. I do these things because I want to celebrate a part of who I am. A celebration that I thought would never happen. When I look at the acronym for International Stuttering Awareness Day (ISAD) I see the phrase “I sad” and instantly think of the Alanis Morissette song, "Ironic.” It's ironic because one of the things that brought me such great amounts of self-doubt, embarrassment, and at times sadness a few years ago, now has brought me much joy, a great community, a passion, and another thing in life to celebrate. I(am)SAD no longer but I am accepting and celebrating. So happy, yes happy, International Stuttering Awareness Day!